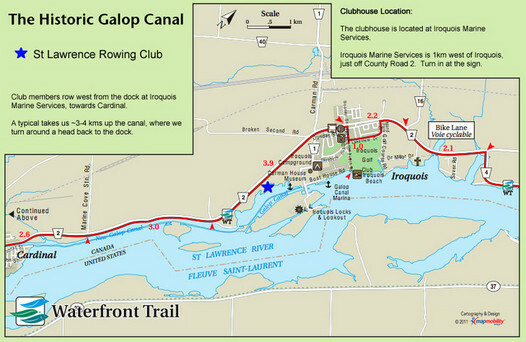 We are a fun, friendly recreational rowing club based in Iroquois, Ontario. We row on a beautiful stretch of calm, uncrowded water in the now-disused Galop Canal, adjacent to the St. Lawrence Seaway Locks. Club members meet several times a week during the season (based on individual preferences) to row in singles, doubles, 4- and 8-person boats. Each year we run a Learn to Row program for new rowers, and its a great way to discover if rowing is for you. 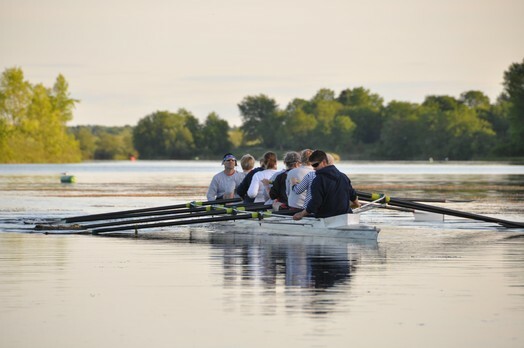 Many of our members started out in the Learn to Row program, and quickly progressed to being regular rowers who compete in recreational regattas in Ottawa and Peterborough each year. For more information, please visit our Programs and Membership page. Pictured above: Andy bringing in the eight with the Learn-to-Row crew. The 2019 Learn-to-Row Program registration opens March 17 (maximum 10 participants). We look forward to welcoming our new rowers to the Club. The Annual General Meeting for the Club will be held at the Township Building (Council Chambers - 3rd floor) at 6:30 in Morrisburg April11. Please join us, and bring your registration form and payment. Above: The end of a nice night out on the Galop canal.